Biochemistry for Materials Science: Catalysis, Complexes and Proteins unlocks recent developments in the field of biochemistry through a series of case studies, enabling materials scientists to harness these advances for innovation in their own field, from the design of bio-inspired materials, to the use of new classes of catalyst. 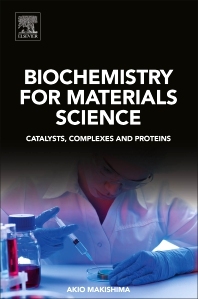 The book is broken up into six independent parts that include an introduction to seven recent discoveries, a discussion of the fundamental knowledge and techniques of biochemistry, a look at a number of biochemical materials, and an exploration of the areas of life science, organic chemistry and inorganic-related materials. The book concludes with a discussion of cosmochemistry. Provides readers with the fundamental knowledge of basic chemistry relating to life-forming materials, catalysis, etc.